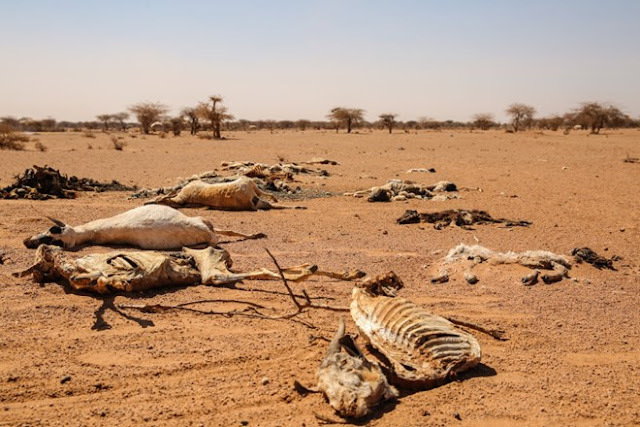 Somalia's prime minister says 110 people have died from hunger in the past 48 hours in a single region as a severe drought threatens millions of people across the country. It was the first drought-related death toll announced by Somalia's government since it declared a national disaster on Tuesday. The United Nations estimates that 5 million people in this Horn of Africa nation need aid, amid warnings of a full-blown famine. Prime Minister Hassan Ali Khaire spoke Saturday during a meeting with the Somali National Drought Committee. The death toll he announced is from the Bay region in the southwest alone. Somalia was one of four regions singled out by the U.N. secretary-general last month in a $4.4 billion aid appeal to avert catastrophic hunger and famine, along with northeast Nigeria, South Sudan and Yemen. All are connected by a thread of violent conflict, the U.N. chief said. Thousands have been streaming into Somalia's capital, Mogadishu, in recent days in search of food aid, overwhelming local and international aid agencies. Over 7,000 internally displaced people checked into one feeding center recently. 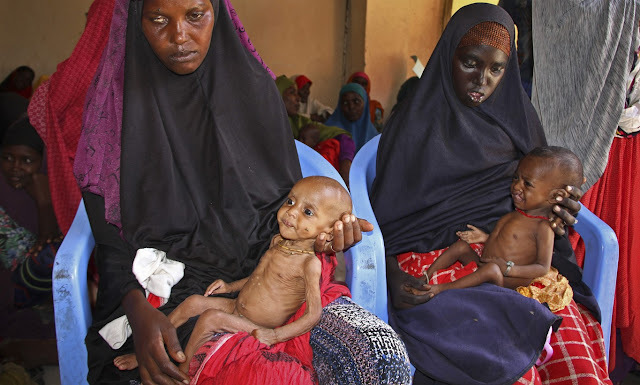 About 363,000 acutely malnourished children "need urgent treatment and nutrition support, including 71,000 who are severely malnourished," the U.S. Agency for International Development's Famine Early Warning Systems Network has warned. Because of a lack of clean water in many areas, there is the additional threat of cholera and other diseases, U.N. experts say. Some deaths from cholera already have been reported. The U.N. humanitarian appeal for 2017 for Somalia is $864 million to provide assistance to 3.9 million people. But the U.N. World Food Program recently requested an additional $26 million plan to respond to the drought.